Welcome to the online bill payment system, secured and operated by CDS Global for MTC Technologies. You may view and pay your MTC bill using electronic check, VISA, MasterCard, American Express, or Discover credit card. 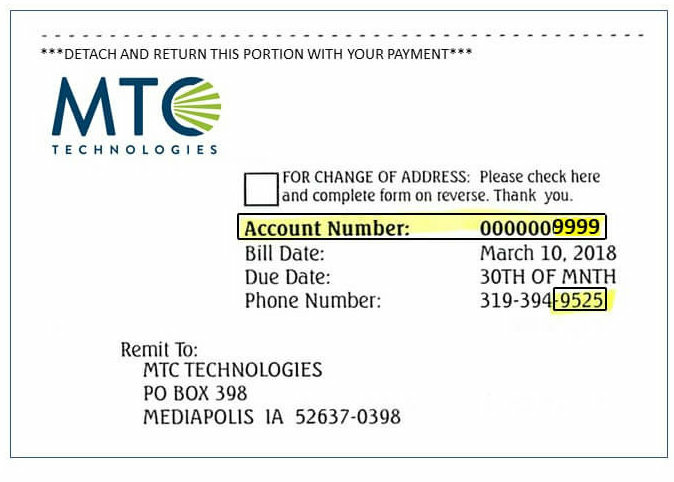 MTC encourages our customers to sign up for the electronic check option. Just click the “Make a Payment” button, then choose “Add a Bank Account” and enter your bank routing & account number. You can choose whatever date works for you! If you sign up for RECURRING electronic bank payments from your checking or savings account – you may qualify for a discount!!! To avoid final notices and late fees, please choose a date from the 10th-30th of the month. You will need to register on the new site. During registration you will be asked for your Service Account and a Security Code. To find these, look in the remit detached area of your current bill (example to the right). Your Account Number will be your Service Account and your Security Code will be 007 plus the last four characters of the number directly under the due date. The security code in the example would be 0079525. When creating username and password within your account, the password requirements are: 6-30 characters, 1 upper case, 1 lower case, and 1 numeric.